All these reports (and there are many!) summarise supplier or customer transactions in many different formats. Many different filters have been incorporated, allowing filtering on transactions, names, prescribers, items, categories and departments. The filters that do not apply to different reports are hidden as required. Feel free to mix and match and experiment with the filters and different reports to see the different views of information that you can get. Select the type of report you want from the Type of report list in the top left. 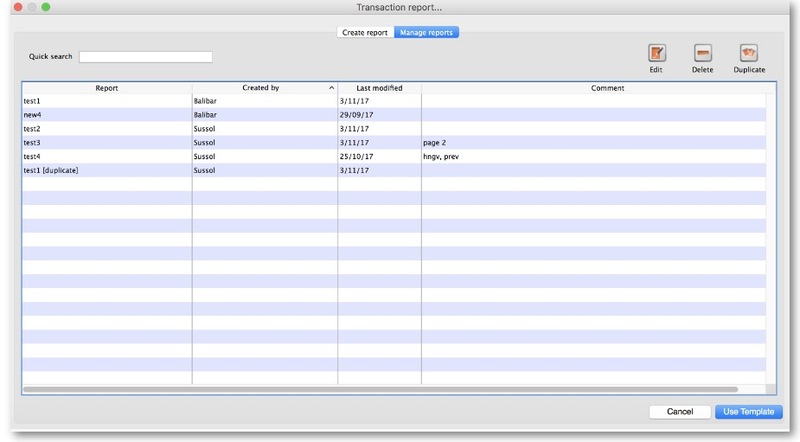 Select the date range of transactions you want included in the report in the Date range section. 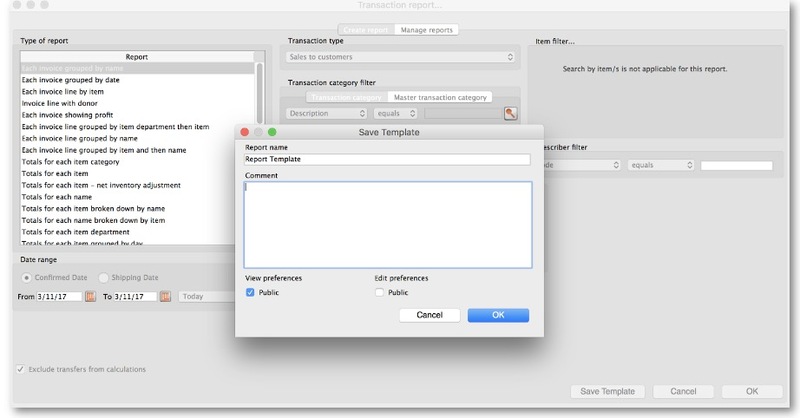 Select the transaction type you want the report to run over in the Transaction type section . Set any other filters/settings you need to refine the contents of the report (Transaction category, Name, Item, Stock, Prescriber filter etc. sections). Click on the OK button to run the report - you can select whether you export it to Excel or print it on the next window that opens (well, mostly - some reports are exported to Excel only so you won't have a choice for them!). See below for more in-depth detail on all these steps. The following table lists the available report names, and gives brief details of the information provided by each report . 2 period comparison by item category User selects two periods, and the transactions for each period form a column. 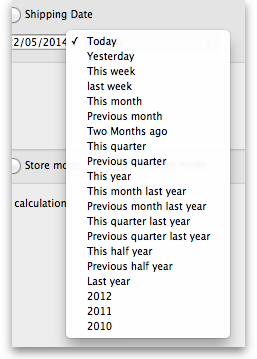 The rows are determined by the item category. This is a special report that has different input options. See entry below. Inventory adjustment - Add stock: All inventory adjustment transactions that resulted in stock additions (e.g. when you did a stock take of an item and counted more on the shelf than the total shown in mSupply). Inventory adjustment - Reduce stock: All inventory adjustment transactions that resulted in stock reductions (e.g. discarding stock due to it being expired). Note that using a report that shows the total for each transaction category can give totals for expired/damaged etc. Inventory adjustment - Net movement: Taking into account both reductions and additions, the nett change in inventory due to adjustment transactions. Enter the date range of transactions to report on, having selected Confirmed date or Shipping date. Note that the date used may differ from the original entry date, depending on how your system is configured in the Preferences. Note that “last year” refers to the year preceding the current year (that is, if the current year is 2012, choosing “last year” will set the dates from 1st Jan 2011 to 31st Dec 2011). 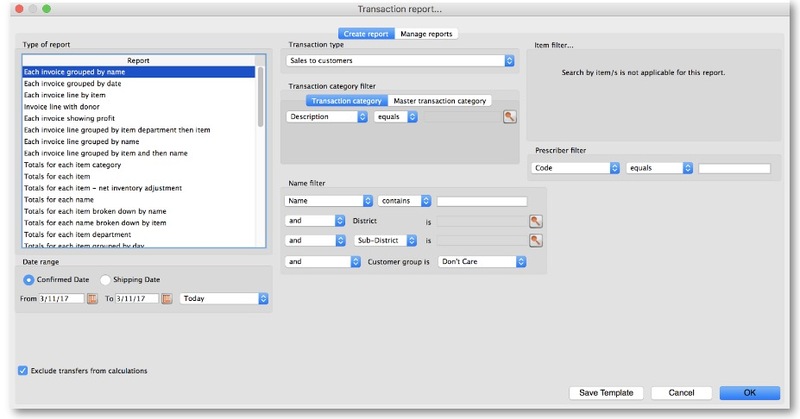 Assuming you have set up transaction categories, your report may be filtered by category. For help setting up Transaction categories click this link. 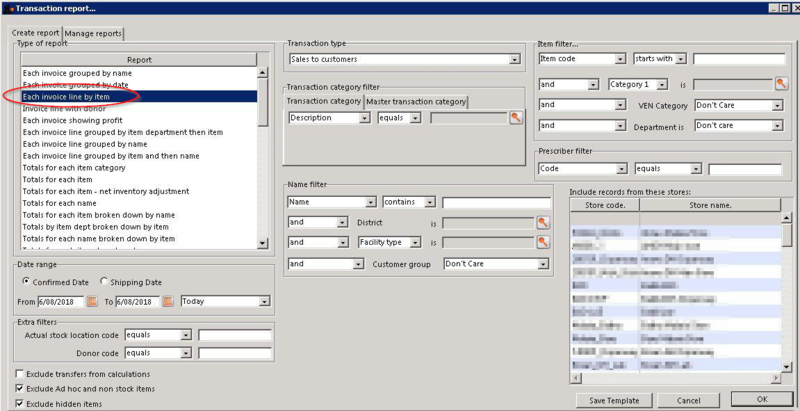 You can enter a particular customer code or category of transactions to be displayed. You can choose from either equals for an exact match or starts with to search for all names whose code or category starts with the entered text. Each name has 6 different categories that can be used to group certain kinds of names together. You can filter on category 1 (which is hierarchical) using the Category 1 filter in the screenshot at the top of the page (note that the Category 1 text will be replaced with any name you have assigned to this category in the preferences) and one of the other categories using the Category 2 filter shown in the screenshot at the top of the page. If you want to report on transactions for a single name, you can find their code by looking up their details using Supplier > Show suppliers or Customer > Show customers. There is also a Customer group filter you can use to include names based on their customer group. Here you can specify the items to include in the report. If you have donor tracking turned on in the preferences, and choose a report that bases it's data on invoice lines, then you will be given the option to filter the report for a particular donor or group of donors. If you are using mSupply in both store and dispensary mode, you might want to report only on transactions in store mode (items distributed to customers) or in dispensary mode (items distributed to patients). You can do this by checking Store mode or Dispensary mode radio button depending on your requirements. This checkbox enables you to choose whether you include stock transfers (where stock is transferred from one store to another in mSupply) in the report calculations. 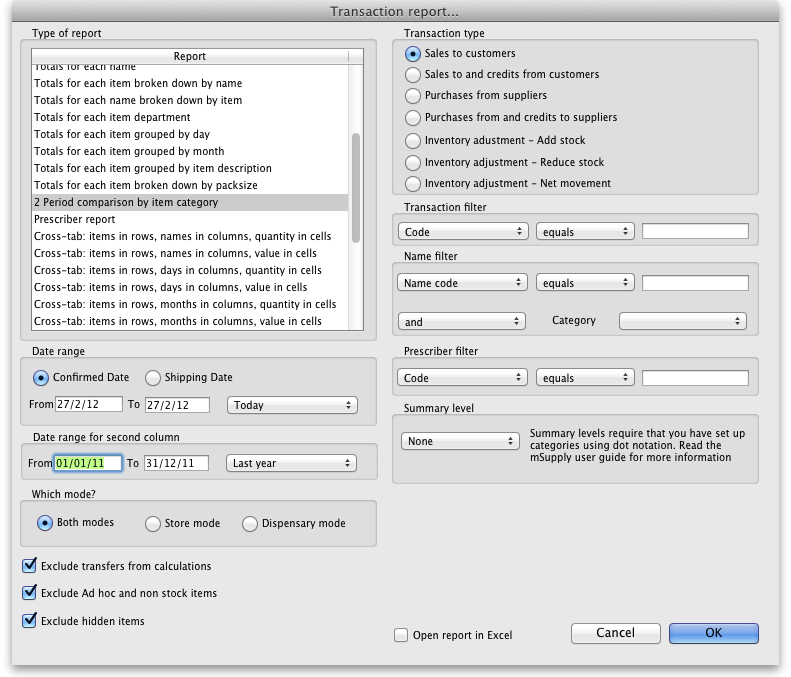 If you want stock transfers to be included in your report then uncheck this checkbox. If you want stock transfers to be left out of the report then check this checkbox. This report allows you quickly to compare sales or purchases for 2 periods of your choice based on item categories. When you choose this report a different set of options is shown. Set the date range for each of the columns and then choose a summary level. It should be noted that if no data is present for the first period defined, this report will not run. 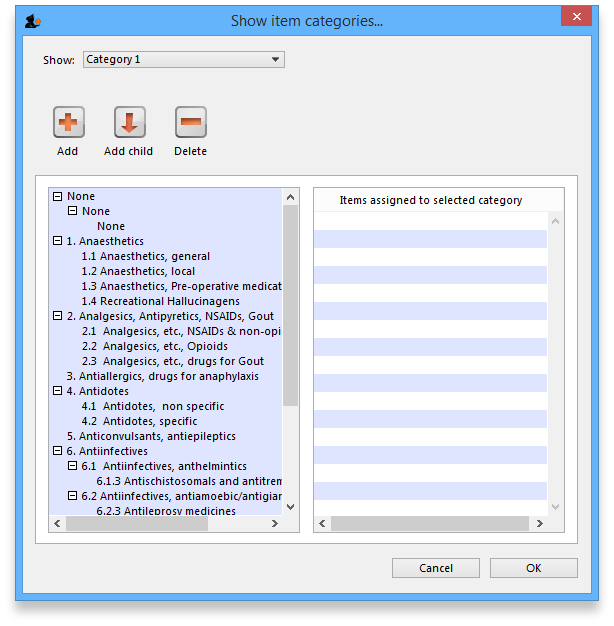 The summary level is based on the item category field. If you have set up item categories using dot notation, then you can summarise categories. Separate each level of your hierarchy with a period (dot). You can use any characters, as long as you don't use a period or a space within one level; e.g. “surgical.gloves.small” is a valid entry. (Level one is “surgical”, level two is “gloves” etc.). When the hierarchy part of the category name is finished enter a space character. You can then enter a description for that level of the hierarchy. Note that if you have items to which no category has been assigned, they are shown under the heading `none“ at the top of the report. The categories are printed in the order that you have specified by drag-and-dropping in the window shown by choosing Item > Show item categories…. Prescriber filter: Reduces the found transactions to those for the given prescriber only, depending upon the selection made (equals, starts with, contains, is not equal to). Obviously only useful in dispensary mode. Exclude transfers from calculations: The check-box Exclude transfers from calculations when checked will ignore transfers between stores within the organisation. Exclude Ad Hoc and non stock items: The check-box Exclude Ad hoc and non stock items is displayed accordng to the type of report selected. By default, it is checked. When checked, the transaction report generated will not include any Ad Hoc items or non stock items (items you don't normally keep in stock). These four reports should be regarded as templates for you to design your own report . Choose an appropriate name for your report, and any comment you wish, and click OK. You are returned to the Report management window, where you should scroll down until you reach the report you have created; note that the name you gave the report will appear in the Custom name column; highlight the row and click Edit report . The save template button allows you to save a given report as a template once you have input your chosen settings. Templates can be reused as needed. 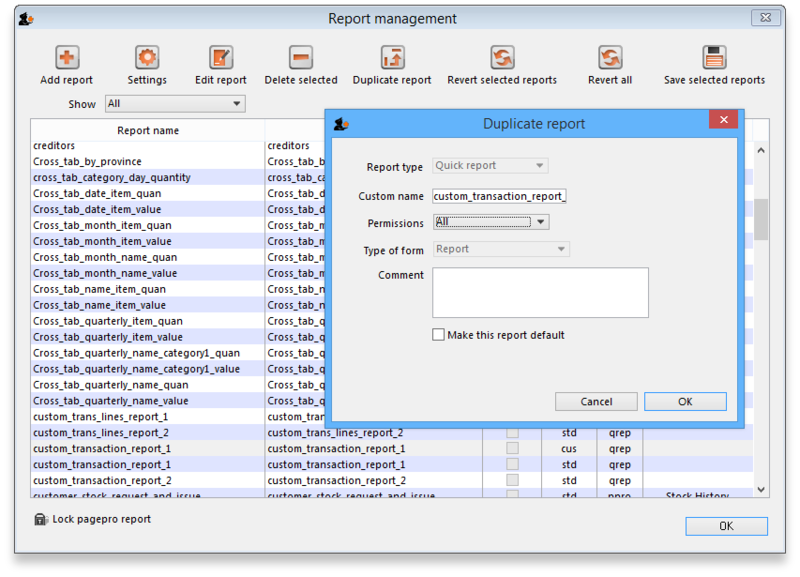 This dialog allows you to set a name and description for the report template. You can also define user permissions: at the moment, you can define these as ‘Public’ - for anyone, or ‘Private’, in which case the permissions only apply to the user who created the template. View Preferences: define which stores will be able to view and use the template on the ‘Manage Reports’ tab (next screenshot). Edit Preferences: define which stores will be able to edit or delete templates on the ‘Manage Reports’ tab. There is an almost infinite range of reports that you might want to generate from transaction data. If you are comfortable using Excel Pivot tables, there is an mSupply transaction report format that you will likely find quite useful. This report has been designed to work in Supervisor Mode but will also work in a single store. The report will open in Excel in a form that can then be easily filtered, sorted and manipulated through a Pivot table. If fact, the records are not sorted at all, so they must be processed to make any sense!